Creating a paper doll is a labor of love for any artist, and especially those of us who played with them as kids while we daydreamed about becoming one of the commercial artists who produced those beautiful books in the 1940s and 1950s. The fact that Jenny Taliadoros is revitalizing the paper doll word with the reprinting of vintage books and the commission of new works is exciting, indeed. When I learned of her undertaking, I immediately began to think of ideas for this new generation of paper doll books. As with any creative endeavor, a work of art, literature or music, the idea comes first. Because my passions have always been movies and fashion history, I mulled over several possibilities. A book devoted to the USO canteens of World War II? Or maybe the costumes of a Hollywood designer like Adrian or Orry-Kelly? Of course, there are many celebrities, both bygone and current, who would make marvelous paper doll subjects. Cher! J-lo! Roz Russell! Mary Tyler Moore! The Gabor Sisters! My head reeled with ideas. At last, I thought of the family sitcoms of the Fifties and Sixties and the actresses who played Moms like Harriet Nelson, Donna Stone, June Cleaver and Margaret Anderson. The legalities of producing a celebrity paper doll book are complicated. Arranging to obtain the rights to specific stars is a veritable minefield of difficulties. (I have just obtained the rights to create a new version of the “Marsha Hunt” little book I self-published a few years ago. That was easy because I know Marsha personally from the Los Angeles parties organized by Gene Maiden.) 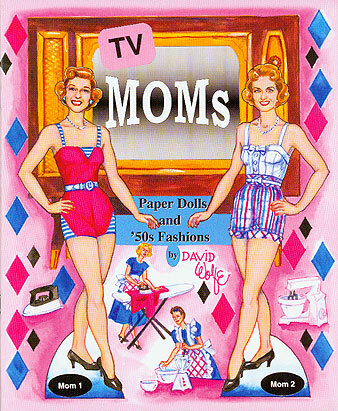 I ran my idea for “TV MOMs” past Jenny and we decided that we would have to circumvent possible problems by devoting the book to the “concept” of those idealized TV mothers and not make the dolls so specific. Once the idea was nailed-down, the creative fun began. Researching the images and information I wanted as inspiration was so easy thanks to the Internet. Google’s vast resources made it simple for me to pull up images of the actresses who portrayed the Moms on early TV: Jane Wyatt of “Father Knows Best,” Barbara Billingsley of“Leave It To Beaver” and of course, Harriet Nelson and Donna Reed. It was fascinating to discover the facts behind the successful series; when they premiered, how they developed and most importantly, how they reflected the hopes and dreams of post-war America. The woman’s role in society then was so very different from today that I realized this paper doll book would carry some real historical significance for little girls of today. Because of my career in the fashion industry, I am a fashion history buff and over the years I have collected a comprehensive library of books covering centuries of apparel and accessories, the designers and stylish women. But I didn’t want to copy authentic clothes. What fun would that be? Instead, I decided I would design “originals” that incorporate the trends and the looks of that period. It was an interesting time for fashion, the segue between the doll-like femininity of “The New Look” with its wasp waists and full skirts and the in-coming streamlined simplicity of the early ‘60s, the look now so strongly associated with Jackie Kennedy. Once the research was complete and I had stewed about the idea, thinking of different possible presentations, I got down to the actual making of the book. The first step was to create the dolls. I choose poses typical of the times, the graceful stance assumed by models then and decided to replicate each pose twice so that the dolls would have twice as many fashion options. 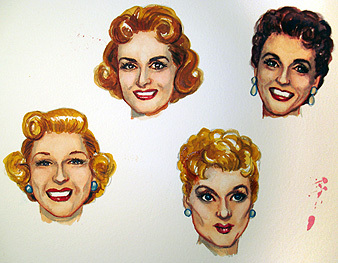 I sketched the figures and pasted onto them Xerox copies of the heads of the actresses I wanted to emulate. I decided on the size of the original artwork, a proportionately enlarged representation of the size that the finished book would be, about a third bigger. Then I began to work on preliminary rendering of the covers. I wanted the book to have a really vintage look and the first attempts became too heavy-handed. I incorporated little visions of Moms-at-work ironing and cooking. I executed three preliminary versions, each time making little adjustments in color or drawing. I decided my original pink was not “hot” enough and the figures were too elongated and too broad-shouldered. As a former fashion illustrator, I invariably tend to draw women who in real life would be toweringly tall supermodels. Because even the enlarged scale of the artwork is not big enough to allow for exacting renderings of faces, I paint the heads separately, 50% bigger than they need to be, then reduce them on a color copier and paste them onto the headless doll figures. Getting a likeness that satisfies me is tricky because I definitely don’t want the art to look like a photo. I want a doll-like, perfected image that closely resembles, but doesn’t exactly replicate the face of the actress. Usually several attempts are necessary before I am happy with the results. Every artist is a perfectionist and I may be worse than some. At least I haven’t cut off my ear...not yet, anyway! After the covers are complete, then it’s time for the clothes and accessories. I like to separate tops and bottoms of outfits and offer different accessories so that anybody who cuts out the clothes can do as I did when I was a kid, become a sort of fashion coordinator and put together different outfits. Once I have a design in my head, I place the completed cover on a lightbox and then on lightweight paper, I draw the garments over the figures so they are sure to fit. After drawing each outfit in pencil, I cut out these rough sketches and arrange them on sheets of paper, taping them down and making layouts for the eight pages of clothes that will constitute the book. Then each of these pages is placed on the lightbox and the layouts are carefully traced onto heavy watercolor paper. My technique for rendering paper dolls has been evolved in an effort to reproduce the lavish look of vintage books. Once the pencil rough is done, then I outline everything with felt tip pens. It is at that time that I make my final color choices, endeavoring to make the pages harmonious. I then clean up the pages with a kneaded eraser, getting rid of all the pencil lines. The paints I prefer are gouache, a sort of heavy watercolor much like poster paint. I like the fact that that it can be watered-down or heavily applied and allows for a variety of techniques. When the paint is dry, I add accents applied with soft colored pencils. The final touch is the addition of those oh-so-necessary tabs. When the artwork is all done, I switch from being an artist to being a writer. Jenny’s paper doll books usually include information and explanations on the inside cover. I’ve written star bios for several of her editions and it was great fun to be writing about the TV MOMs for inclusion in a book I had created myself. I am not a full-time paper doll artist. I continue to work as a Fashion Trend Forecaster in New York City and my career requires a great deal of travel. So my paper doll-ing is done in my down time when I’m week-ending in my country home. I spend many happy evenings painting while listening to music or watching DVDs of old movies out of the corner of my eye. I worked on “TV MOMs” for about three months. Now I’m looking forward to the day when I can become a kid again, sit quietly in a corner, scissors in hand and cut-out the dolls and clothes that I created. Making the “TV MOMs” paper doll book has made me realize that clichés are truisms because it honestly has been a “dream come true” for me.